Shrimp stir fry usually has an Asian flavor but we thought we’d give it an Italian flair. Instead of soy sauce and ginger, think garlic, lemon, and oregano. We substitute linguine for the rice and add the pasta directly into the shrimp stir fryThis is a quick one pan meal that takes less than 15 minutes to cook and only 30 minutes to prepare. And for those of you who are sticklers for accuracy, we know we use two pans, one for the pasta and one for the stir fry. You may use the same pot you used for the pasta. Whichever way you do it, we’re sure Italian Style Shrimp Stir Fry will become a family favorite! This recipe has been updated from the original February 2017 version in order to provide a better experience for our readers. Last update February 2019. 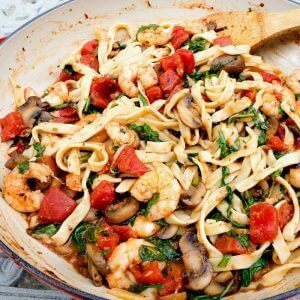 For this recipe you will need: linguine, shrimp, olive oil, butter, garlic, red pepper flakes, oregano, arugula, baby Bella mushrooms, diced tomatoes, parmesan cheese, Italian parsley, fresh lemon juice, salt, pepper. As we mentioned in the Salmon with Pesto post, wild-caught is the best and it’s the same with shrimp. We know cost is a factor; it’s the same with us. But when you put the pros and cons side by side, wild-caught wins. The main problems that shrimp farms post are environmental, community, and health. Let’s take them one by one. Environmental: Shrimp farms threaten mangrove forests, coastal wetlands that provide vital habitat for natural fisheries and protect coastlines from damage to storms, hurricanes, and tsunamis. Farmed shrimp is unsustainable. After a few years, disease and pollution deplete the ponds. Farmers search for other areas and so they perpetuate the environmental destruction. Community: Shrimp farms takes a toll on the people of coastal communities. Fishing villages who rely on mangroves for food and resources remain poor and without alternatives. The farms also block access to coastal resources which limit access to fishing sites, building materials, food, and medicines. Health: Most shrimp farms are so crowded that producers must use high levels of pesticides, antibiotics, and other chemicals (many of them banned in the United States) in order to prevent disease. Here I’m speaking of imported shrimp. Just like the best fruit and vegetables are the ones that are in season, so are the wild-caught shrimp. Wild-caught shrimp is sweet, succulent, with a nice firm texture. You can rest assured that there are no added antibiotics or growth hormones. Shrimpers have to follow stringent regulations and shrimp season is marked and anyone disobeying is heavily fined. 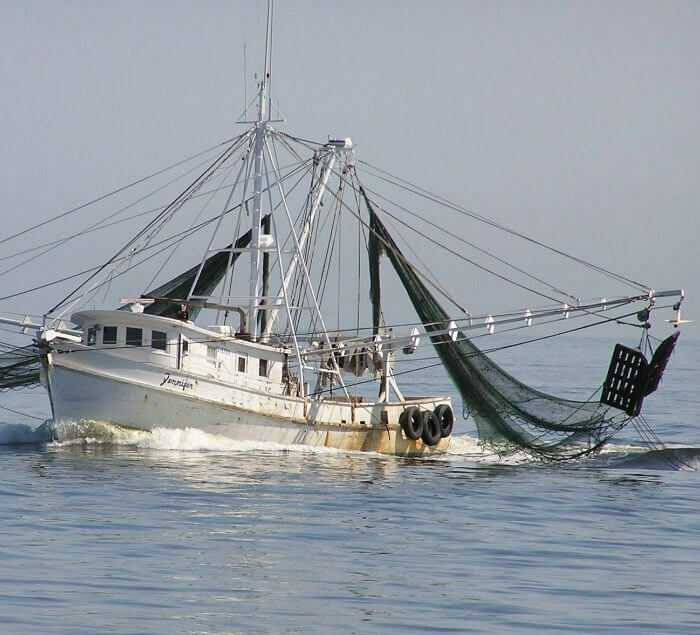 By purchasing wild-caught shrimp you are supporting the local economy of the shrimpers, fisheries, as well as the broader U. S. shrimp industry. Once you take your wild caught shrimp home, you’ll need to peel them and set them in the fridge as you prepare your other ingredients ready. The next steps go quickly. Clean and slice the baby Bella mushrooms. Measure out the already washed arugula. Dice the fresh Italian parsley, peel and mince the garlic cloves, squeeze 1/2 lemon into a small measuring cup. Measure and place in prep dishes the Parmesan cheese, pepper flakes, dried oregano. Get 1/2 of a 1 pound package of linguine. Italian Shrimp Stir Fry is a tasty variation to an Asian stir fry. Everything is done at the last minute so be sure your table is set and your family is ready. All you have to do is call them to dinner. Be prepared to get lots of “YUMS” when you serve this outstanding one pot meal. And the bonus? You don’t have lots of pots and pans to clean up. You can easily double this recipe depending on how many you want to feed. You can’t go wrong with any of these dishes. They are tasty, easy, and you can’t beat one pan for clean up. This braiser pan was a Christmas gift from our oldest son. At the time we didn’t realize how much we’d use it. It is enameled cast iron and it goes from stove top to the oven. It is wonderful to make one-pan meals and we use it at least once a week. Stir fries are absolutely wonderful ways to get loads of veggies and protein into one delicious dish. We decided to shake things up a bit when we went for Italian flavors rather than Asian. Add any Italian vegetable you love. Go for zucchini or baby spinach and even fennel. Include your family’s favorite pasta. We used what we had and so can you. I can guarantee your family will love this recipe! 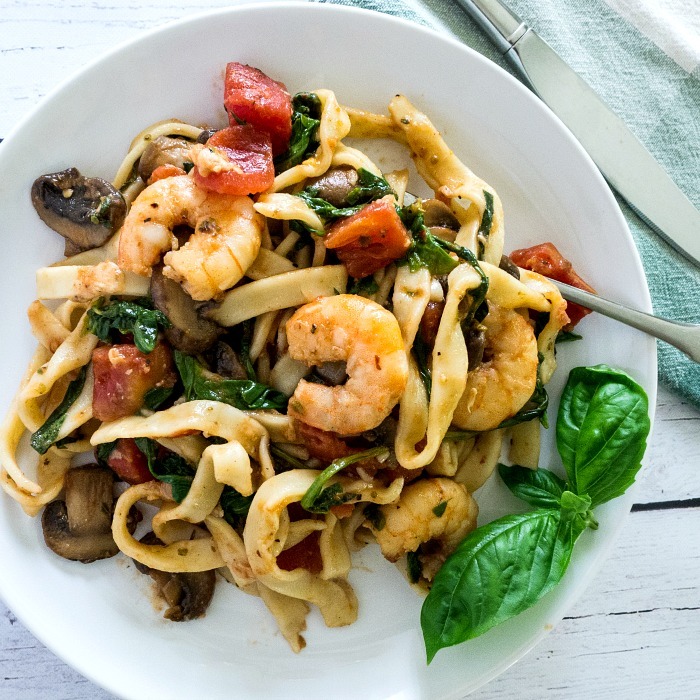 Shrimp Stir Fry Italian substitutes the usual Asian flavors with garlic, lemon, oregano, hot pepper flakes, tomatoes, and arugula over your choice of pasta. In a large pot bring water to a boil, salt the water, add the pasta. Cook according to directions until al dente. ( we used our frozen homemade pasta for this dish. You can use the same pot for the rest of the dish but we used a large pan. On medium high heat the olive oil and 2 tablespoons of butter. Add the garlic and red pepper flakes and cook until fragrant being careful not to burn the garlic. Toss in shrimp, add salt and pepper to taste. Stir until shrimp start to turn pink. Remove the shrimp and set aside. Shrimp cooks fast and you don't want to overcook it. Add oregano and the fresh sliced mushrooms. Continue to stir until the mushrooms start to release their liquid. Add the canned tomatoes with juice and let simmer for 5 minutes more. Return cooked pasta to the pot, add the arugula and continue to mix. Once the arugula starts to wilt add the shrimp, remaining butter, parmesan, and parsley. Stir until well mixed and the butter is melted. Add lemon juice and mix again. Serve while hot! Buon appetito! I couldn’t agree more on your take of farm raised vs. wild caught. You never know about the quality of the farm where the shrimp are raised. This Italian spin on the recipe is right up my alley. I love the Italian flair on this stir fry! I can’t wait to give this a try it is such an elegant dish! I LOVE the idea of an Italian stir fry! I’m totally on a pasta and shrimp kick right now too, so I’m loving this. What a fantastic spin on an Asian stir fry! You can’t go wrong with the Italian flair in our books 😉 . So with you on buying wild-caught shrimp! Yum!!! Such a great dish this time of year for a quick, lightened up yet comforting meal. I love the simple yet flavorful ingredients. Perfectly balanced flavors in this dish. I like shrimp in general, and would like to try to make a stir fry with it! Looks delicious! I think I still have some shrimp in the freezer I can pull out to make this for supper! I love trying new one pan meals and this one is a must try for me. It looks so tasty! Yes please! This recipe looks absolutely delicious. I’m glad you went over the pros of buying wild caught shrimp. When you put it that way, wild caught always wins! My husband looooves seafood and I’m always looking for new interesting dishes to make for him. He is going to love this. Thanks for sharing! I definitely think there is a difference between fresh caught and farm raised! 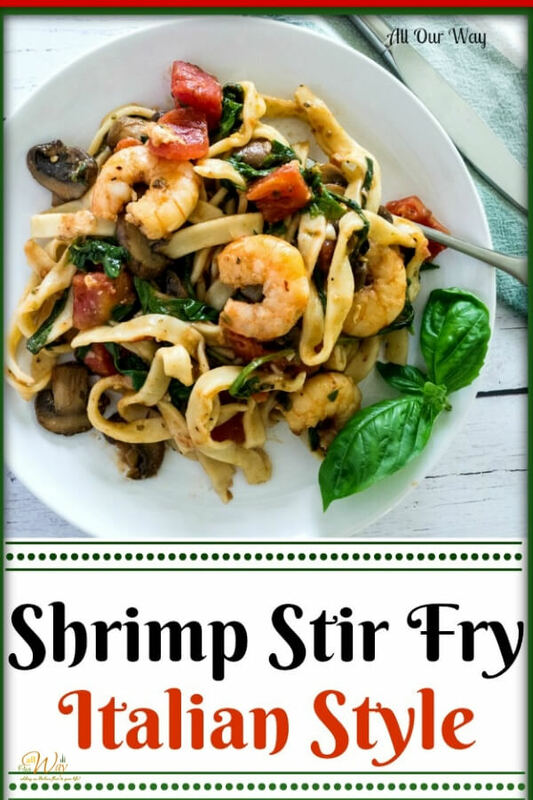 Your shrimp stir fry looks so delicious and I love that it’s a one-pan meal!! Yup gotta love those one pan dinner options. Especially this time of year. My lists are long, and the days fly by. I barely have time to eat dinner, never mind make it. At least with this…I would double it and have a meal for yet another busy day. You can never go wrong with pasta, shrimp and wine!! I think you idea of an Italian stir fry is a good one and your dish looks good. I like the addition of arugula in the stir fry. Thank you, Karen! 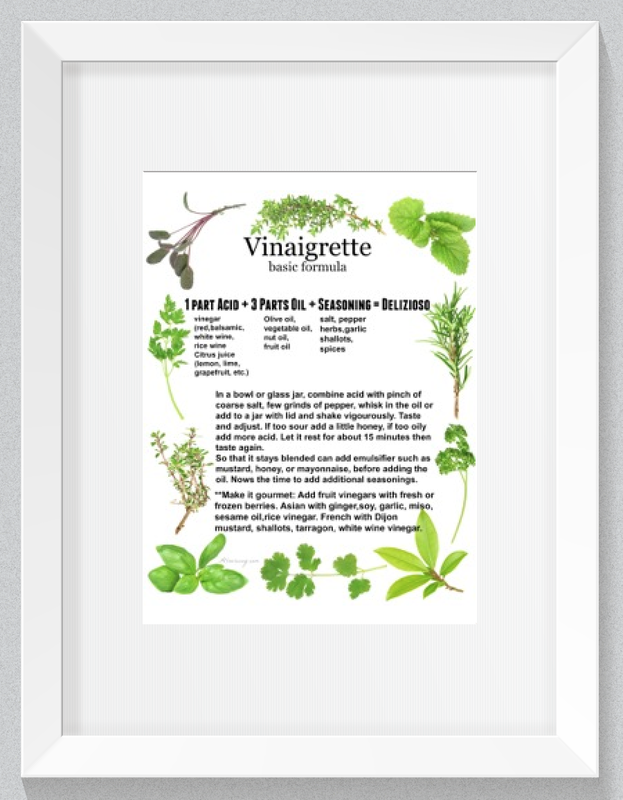 It is very good and we love adding greens to our dishes. I want to take a big fork and dig into the pot! It looks so good! Hi, Whitney! It was really good! Making another pan this week. I know very little about fresh-caught shrimp. Thanks for the info! You’re welcome, Kitty! If you had a chance to sample the two side by side you’d be able to taste the difference. Your shrimp stir fry looks nutritious, Marisa. I like it that is seems like a mix of Italian and Chinese. Can imagine enjoying it with a glass of white wine. Molly, you are always welcome at our house! And we’d love to have you share whatever we’re having. The more the merrier!! Such a creative idea! You’re right – I do always think of Asian flavors for a stir fry, but the Italian version sounds so delicious. Hello, Julie! I hope you try the Italian version — if you do, let me know how you like it. I’ve changed my buying habits in the last few years and will buy only wild caught Gulf shrimp. Thanks for informing your readers, and for a delicious recipe. We know what you mean about changing buying habits, Linda. Convincing Hubby that wild-caught really was better for us and the environment took a little while. Once he realized the difference he won’t go back to the farm raised. Oh! and Happy Valentine’s Day! Hope you and your hubby have a nice evening together. Garlic, lemon, and oregano sounds perfect in this stir fry. I think I could pursue even my husband who’s not a big fan of seafood to try this. Looks delicious! That is a great seafood meal and you have the perfect balance of flavors in there. One pot meals are the best! The flavors just marry so much better and clean up is a breeze. I agree that wild-caught shrimps are better than most that come from shrimp farms. 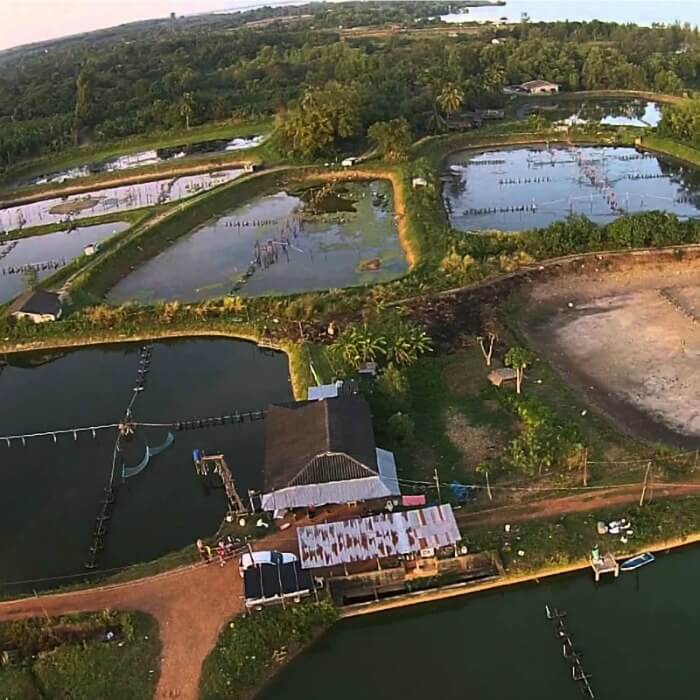 But there are also shrimp farms that follow sound environmental practices. I guess the trick there is to get to know your local farmers so you know where your food comes from and how they were raised and/or harvested. I agree, we really should be vigilant when it comes to food ingredients, especially seafood… when their freshness matters a whole lot. And I love seafood! In fact, I also found two other yummy seafood recipes, and I absolutely can’t get enough of them. I enjoy shrimps a lot I actually buy local Florida shrimp when in season nothing like wild caught seafood and fish. Drooling over this amazing pasta! Hi, Adriana! We are in Florida now too and we do look for local. Hope you try the recipe. I love all of the flavors and colors yove developed here! Unfortunately for us my littlest one is allergic to shrimp- but I’m thinking next date night when the kids are away this will be perfect for a romantic dinner! Hello, Hanady! I understand about the allergy. My oldest son is now allergic to shellfish. When he was little he would gobble them up. Perhaps too little and too much? I would certainly monitor the amount given now. Looks so stinkin’ delicious! Those shrimp… Mmmmm! Ciao, Gigi! We do love our shrimp. Hope you give the recipe a try. What a pretty dish! Such appealing colors. I like the Italian spin on the stir fry. Especially since the whole meal is made in one pan. Nothing beats quick clean up! I refuse to buy anything but non-imported shrimp! And wild caught is even better. After all the stuff in the news last year about the shrimp slave workers, I just couldn’t buy imported anymore! But with the right shrimp, this looks AMAZING! Thank you, Sarah! We did hear lots of stories about the workers — fishing is a tough job. I’ve been craving shrimp so much lately so this recipe is just perfect for the stock I’ve got going on in my freezer. I love all of the Italian flavors. I’m a huge mushroom fan, but the family is not, so I would leave them out and make myself some on the side to add in because I think they sound wonderful in here! Hello, Megan. The flavors are really great and what a great idea for you to add the mushrooms separately. That certainly would work. Happy Valentine’s Day!. Merisa I love the pictures!! I am a huge fan of shrimps but we get only frozen here so will have to make do with that. I like how you have found a delicate balance of flavors and finished it so nicely with the lemon. I can almost sense those coming together so nicely. We live in Georgia, so wild-caught shrimp from the coast are a real treat. They would be perfect in this Italian style stir fry with shrimp. Hi, Pam! Hubby and I are very partial to Georgia. 🙂 We spend several months on Saint Simons Island and they do get wild-caught shrimp. This really looks like a dish I saw when I visited Rome years ago. They seem to make a lot of one-pot meals over there. Hi, Stephanie! I believe you could sub any meat for the shrimp, although we are very partial to shrimp. Chicken would be good. This looks so light and fresh! Sometimes pasta dishes can feel a little heavy but I doubt that’s the case with this one with all those fresh veggies and flavors! Hi, Sara! I should have added that if there are some people who can’t take regular pasta, they could sub the gluten-free. This looks incredible, Marisa! I might have to make this for Valentine’s day or my husband’s birthday which is the day after. Yum! Marisa, that dish looks phenomenally delicious! I’m not a lover or shrimp, but they look so tasty in this dish. And, just like with any great seafood, you made sure the flavours were just right with the heat and the fresh lemon. Perfection! Byron, thank you for your nice comment. Not everyone loves shrimp or seafood, perhaps you could sub chicken in instead? We were just wanting a variation for our usual stir fry. It’s great to see a recipe that gives a little advice on buying sustainable and environmentally friendly ingredients, it’s really helpful! And I love the idea of giving stir fry an Italian twist! Hello, Laura! I’m glad you found the post informative. Honey and I sure have changed with the seafood we purchase. Hope you try the stir fry. I’m with you on the farm-raised shrimp (and fish) versus wild shrimp (and fish). The taste is definitely superior and I don’t always trust what they feed the shrimp. Maybe I’m a bit cynical. Love the dish by the way, full of inviting color. Thank you, Mark! You’re right about what they feed the farm-raised fish. We’ve stopped all farm-raised seafood, and we’ve also been quite careful about where the wild-caught comes from, so I’m with you in your cynicism. Looks delicious! Can’t wait to try this recipe……My kind of meal? Healthy, easy and delicious all in one pan meal? Thank you, Susie! As busy as you are this would be great during the week. Happy Valentine’s Day to you and the family. Love and hugs! You had me at butter and garlic! YUM!!! Annnd of course, pasta, lol. I’m sure this would fit somewhere on a diet, right?? Italian food all the way! Love. This is fantastic diet food!! 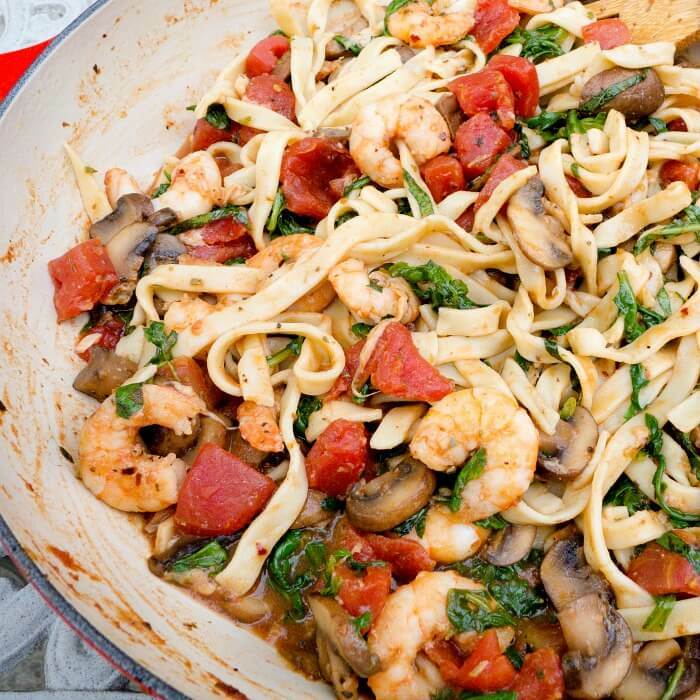 You have tomatoes, arugula, garlic, butter and olive oil (fats are very important for our health), shrimp for protein, and then pasta for ultimate satisfaction. Yep!! It says diet all the way, Elizabeth. I know Ellie would agree with the logic. 🙂 Happy Valentine’s Day!! This contains some of my husband’s favorite things, particularly the shrimp and linguine. I bet he’d really enjoy this. Hi, Val! The ingredients taken individually are all our favorites. Combined? Holy Moly! It is so good. I like your version: shrimp, pasta and Italian seasoning – nothing better. Has to be Gulf shrimp! I feel lucky to live here where we can get fresh caught fish daily. Amazing dish you created. Thank you, Jovina! You are so right! Gulf shrimp is the best! We look forward to buying it whenever we can get it. Unfortunately, the red tide is still a bother here in Venice. 🙁 Fishing is terrible. We’re hoping it will improve. Do you get any of the red tide effects? No maybe because we are so far north. Only happens once in awhile in August or September. Sorry fishing is not so good. I know you and your husband look forward to catching some good fish.